A princely state, also called native state, feudatory state or Indian state (for those states on the subcontinent), was a vassal state under a local or regional ruler in a subsidiary alliance with the British Raj. Though the history of the princely states of the subcontinent dates from at least the classical period of Indian history, the predominant usage of the term princely state specifically refers to a semi-sovereign principality on the Indian subcontinent during the British Raj that was not directly governed by the British, but rather by a local ruler, subject to a form of indirect rule on some matters. In actual fact, the imprecise doctrine of paramountcy allowed the government of British India to interfere in the internal affairs of princely states individually or collectively and issue edicts that applied to all of India when it deemed it necessary. At the time of the British withdrawal, 565 princely states were officially recognised in the Indian subcontinent, apart from thousands of thakurs, taluqdars, zamindaris and jagirs. In 1947, princely states covered 40% of area of pre-Independent India and constituted 23% of its population. The most important states had their own British Political Residencies: Hyderabad, Mysore and Travancore in the South followed by Jammu and Kashmir and Sikkim in the Himalayas, and Indore in Central India. The most prominent among those – roughly a quarter of the total – had the status of a salute state, one whose ruler was entitled to a set number of gun salutes on ceremonial occasions. The princely states varied greatly in status, size, and wealth; the premier 21-gun salute states of Hyderabad, Jammu and Kashmir were each over 200,000 km2 (77,000 sq mi) in size. In 1941, Hyderabad had a population of over 16 million, while Jammu and Kashmir had a population of slightly over 4 million. At the other end of the scale, the non-salute principality of Lawa covered an area of 49 km2 (19 sq mi), with a population of just below 3,000. Some two hundred of the lesser states had an area of less than 25 km2 (10 sq mi). The era of the princely states effectively ended with Indian independence in 1947. By 1950, almost all of the principalities had acceded to either India or Pakistan. The accession process was largely peaceful, except in the cases of Jammu and Kashmir (whose ruler opted for independence but decided to accede to India following an invasion by Pakistan-based forces), Hyderabad (whose ruler opted for independence in 1947, followed a year later by the police action and annexation of the state by India), Junagadh (whose ruler acceded to Pakistan, but was annexed by India). and Kalat (whose ruler declared independence in 1947, followed in 1948 by the state's annexation). Though principalities and chiefdoms existed on the Indian subcontinent from at least the Iron Age, the history of princely states on the Indian subcontinent dates to at least the 5th–6th centuries C.E., during the rise of the middle kingdoms of India following the collapse of the Gupta Empire. Many of the future ruling clan groups – notably the Rajputs – began to emerge during this period; by the 13th–14th centuries, many of the Rajput clans had firmly established semi-independent principalities in the north-west, along with several in the north-east. The widespread expansion of Islam during this time brought many principalities into tributary relations with Islamic sultanates, notably with the Mughal Empire. In the south, however, the Hindu Vijayanagara Empire remained dominant until the mid-17th century; among its tributaries was the future Mysore Kingdom. The Turco-Mongol Mughal Empire brought a majority of the existing Indian kingdoms and principalities under its suzerainty by the 17th century, beginning with its foundation in the early 16th century. The advent of Sikhism resulted in the Jat sikh creation of the Sikh Empire in the north by the early 18th century, by which time the Mughal Empire was in full decline. At the same time, the Marathas carved out their own states to form the Maratha Empire. Through the 18th century, former Mughal governors formed their own independent states. In the north-west, some of those – such as Tonk – allied themselves with various groups, including the Marathas and the Durrani Empire, itself formed in 1747 from a loose agglomeration of tribal chiefdoms that composed former Mughal territories. In the south, the principalities of Hyderabad and Arcot were fully established by the 1760s, though they nominally remained vassals of the Mughal Emperor. 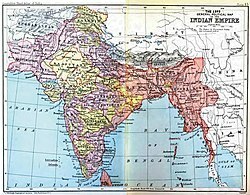 In general the term "British India" had been used (and is still used) also to refer to the regions under the rule of the East India Company in India from 1774 to 1858. The Indian rulers bore various titles – including Chhatrapati (exclusively used by the 3 Bhonsle dynasty of the Marathas) ("emperor"), Maharaja or Raja ("king"), Sultan, Nawab, Emir, Raje, Nizam, Wadiyar (used only by the Maharajas of Mysore, meaning "lord"), Agniraj Maharaj for the rulers of Bhaddaiyan Raj, Chogyal, Nawab ("governor"), Nayak, Wāli, Inamdar, Saranjamdar and many others. Whatever the literal meaning and traditional prestige of the ruler's actual title, the British government translated them all as "prince," to avoid the implication that the native rulers could be "kings" with status equal to that of the British monarch. More prestigious Hindu rulers (mostly existing before the Mughal Empire, or having split from such old states) often used the title "Raja,"Raje" or a variant such as Rai, "Rana," "Rao," "Rawat" or Rawal. Also in this 'class' were several Thakurs or Thai ores and a few particular titles, such as Sardar,Chaudhry, Mankari (or Mānkari/Maankari), Deshmukh, Sar Desai, Raja Inamdar, Saranjamdar. However, the actual importance of a princely state cannot be read from the title of its ruler, which was usually granted (or at least recognised) as a favour, often in recognition for loyalty and services rendered to the Mughal Empire. Although some titles were raised once or even repeatedly, there was no automatic updating when a state gained or lost real power. In fact, princely titles were even awarded to holders of domains (mainly jagirs) and even taluqdars and zamindars (tax collectors), which were not states at all. Various sources give significantly different numbers of states and domains of the various types. Even in general, the definition of titles and domains are clearly not well-established. Photograph (1900) of the Maharani of Sikkim. Sikkim was under the suzerainty of the Provincial government of Bengal; its ruler received a 15-gun salute. Many Indian princes served in the British Army, the Indian Army, or in local guard or police forces, often rising to high ranks; some even served while on the throne. Many of these were appointed as an Aide de camp, either to the ruling prince of their own house (in the case of relatives of such rulers) or indeed to the British monarchs. Many saw active service, both on the subcontinent and on other fronts, during both World Wars. Apart from those members of the princely houses who entered military service and who distinguished themselves, a good number of princes received honorary ranks as officers in the British and Indian Armed Forces. Those ranks were conferred based on several factors, including their heritage, lineage, gun-salute (or lack of one) as well as personal character or martial traditions. After the First and Second World Wars, the princely rulers of several of the major states, including Gwalior, Patiala, Nabha, Faridkort, Bikaner, Jaipur, Jodhpur, Jammu and Kashmir and Hyderabad, were given honorary general officer ranks as a result of their states' contributions to the war effort. At the time of Indian independence, only five rulers – the Nizam of Hyderabad, the Maharaja of Mysore, the Maharaja of Jammu and Kashmir state, the Maharaja Gaekwad of Baroda and the Maharaja Scindia of Gwalior – were entitled to a 21-gun salute. Five more – the Nawab of Bhopal, the Maharaja Holkar of Indore, the Maharana of Udaipur, the Maharaja of Kolhapur , the Maharaja of Patiala and the Maharaja of Travancore – were entitled to 19-gun salutes. The most senior princely ruler was the Nizam of Hyderabad, who was entitled to the unique style Exalted Highness and 21-gun salute. Other princely rulers entitled to salutes of 11 guns (soon 9 guns too) or more were entitled to the style Highness. No special style was used by rulers entitled to lesser gun salutes. A number of princes, in the broadest sense of the term, were not even acknowledged as such. [example needed] On the other hand, the dynasties of certain defunct states were allowed to keep their princely status – they were known as political pensioners, such as the Nawab of Oudh. There were also certain estates of British India which were rendered as political saranjams, having equal princely status. Though none of these princes were awarded gun salutes, princely titles in this category were recognised as a form of vassals of salute states, and were not even in direct relation with the paramount power. The doctrine of lapse was pursued most vigorously by the Governor-General Sir James Ramsay, 10th Earl (later 1st Marquess) of Dalhousie. Dalhousie annexed seven states, including Awadh (Oudh), whose Nawabs he had accused of misrule, and the Maratha states of Nagpur, Jhansi, Satara, Sambalpur, and Thanjavur. Resentment over the annexation of these states turned to indignation when the heirlooms of the Maharajas of Nagpur were auctioned off in Calcutta. Dalhousie's actions contributed to the rising discontent amongst the upper castes which played a large part in the outbreak of the Indian mutiny of 1857. The last Mughal Badshah (emperor), whom many of the mutineers saw as a figurehead to rally around, was deposed following its suppression. ^ "Indian Princely States before 1947 A-J". ^ Datar, Arvind P. (18 November 2013). "Who betrayed Sardar Patel?". The Hindu. ^ Markovits, Claude (2004). A history of modern India, 1480–1950. Anthem Press. pp. 386–409. ISBN 9781843310044. ^ The India Office and Burma Office List: 1945. Harrison & Sons, Ltd. 1945. pp. 33–37. ^ Bajwa, Kuldip Singh (2003). Jammu and Kashmir War, 1947–1948: Political and Military Perspectiv. New Delhi: Hari-Anand Publications Limited. ISBN 9788124109236. ^ Aparna Pande (16 March 2011). Explaining Pakistan's Foreign Policy: Escaping India. Taylor & Francis. pp. 31–. ISBN 978-1-136-81893-6. ^ Jalal, Ayesha (2014), The Struggle for Pakistan: A Muslim Homeland and Global Politics, Harvard University Press, p. 72, ISBN 978-0-674-74499-8 : "Equally notorious was his high-handed treatment of the state of Kalat, whose ruler was made to accede to Pakistan on threat of punitive military action." ^ Samad, Yunas (2014). "Understanding the insurgency in Balochistan". Commonwealth & Comparative Politics. 52 (2): 293–320. doi:10.1080/14662043.2014.894280. : "When Mir Ahmed Yar Khan dithered over acceding the Baloch-Brauhi confederacy to Pakistan in 1947 the centre’s response was to initiate processes that would coerce the state joining Pakistan. By recognising the feudatory states of Las Bela, Kharan and the district of Mekran as independent states, which promptly merged with Pakistan, the State of Kalat became land locked and reduced to a fraction of its size. Thus Ahmed Yar Khan was forced to sign the instrument of accession on 27 March 1948, which immediately led to the brother of the Khan, Prince Abdul Karim raising the banner of revolt in July 1948, starting the first of the Baloch insurgencies." ^ Harrison, Selig S. (1981), In Afghanistan's Shadow: Baluch Nationalism and Soviet Temptations, Carnegie Endowment for International Peace, p. 24, ISBN 978-0-87003-029-1 : "Pakistani leaders summarily rejected this declaration, touching off a nine-month diplomatic tug of war that came to a climax in the forcible annexation of Kalat.... it is clear that Baluch leaders, including the Khan, were bitterly opposed to what happened." ^ Grousset, Rene (1970). The Empire of the Steppes. Rutgers University Press. p. 69. ISBN 978-0-8135-1304-1. ^ 1. Imperial Gazetteer of India, volume IV, published under the authority of the Secretary of State for India-in-Council, 1909, Oxford University Press. page 5. Quote: "The history of British India falls, as observed by Sir C. P. Ilbert in his Government of India, into three periods. From the beginning of the seventeenth century to the middle of the eighteenth century the East India Company is a trading corporation, existing on the sufferance of the native powers and in rivalry with the merchant companies of Holland and France. During the next century the Company acquires and consolidates its dominion, shares its sovereignty in increasing proportions with the Crown, and gradually loses its mercantile privileges and functions. After the mutiny of 1857 the remaining powers of the Company are transferred to the Crown, and then follows an era of peace in which India awakens to new life and progress." 2. The Statutes: From the Twentieth Year of King Henry the Third to the ... by Robert Harry Drayton, Statutes of the Realm – Law – 1770 Page 211 (3) "Save as otherwise expressly provided in this Act, the law of British India and of the several parts thereof existing immediately before the appointed ..." 3. Edney, M. E. (1997) Mapping an Empire: The Geographical Construction of British India, 1765–1843[permanent dead link], University of Chicago Press. 480 pages. ISBN 978-0-226-18488-3 4. Hawes, C.J. (1996) Poor Relations: The Making of a Eurasian Community in British India, 1773–1833. Routledge, 217 pages. ISBN 0-7007-0425-6. ^ Imperial Gazetteer of India vol. II 1908, pp. 463, 470 Quote1: "Before passing on to the political history of British India, which properly begins with the Anglo-French Wars in the Carnatic, ... (p. 463)" Quote2: "The political history of the British in India begins in the eighteenth century with the French Wars in the Carnatic. (p.471)"
^ Great Britain. Indian Statutory Commission; Viscount John Allsebrook Simon Simon (1930). Report of the Indian Statutory Commission ... H.M. Stationery Office. Retrieved 9 June 2012. ^ All India reporter. D.V. Chitaley. 1938. Retrieved 9 June 2012. ^ "King of all rewinds". ^ Govindlal Dalsukhbhai Patel (1957). The land problem of reorganized Bombay state. N. M. Tripathi. Retrieved 9 June 2012. ^ "Mysore," Indian States and Agencies, The Statesman's Year Book 1947, pg 173, Macmillan & Co.
^ "Jammu and Kashmir," Indian States and Agencies, The Statesman's Year Book 1947, pg 171, Macmillan & Co.
^ "Hyderabad," Indian States and Agencies, The Statesman's Year Book 1947, pg 170, Macmillan & Co.
^ "Central India Agency," Indian States and Agencies, The Statesman's Year Book 1947, pg 168, Macmillan & Co.
^ "Eastern States," Indian States and Agencies, The Statesman's Year Book 1947, pg 168, Macmillan & Co.
^ "Gwalior Residency,", Indian States and Agencies, The Statesman's Year Book 1947, pg 170, Macmillan & Co.
^ "Rajputana," Indian States and Agencies, The Statesman's Year Book 1947, pg 175, Macmillan & Co.
^ "Baluchistan States," Indian States and Agencies, The Statesman's Year Book 1947, pg 160, Macmillan & Co.
^ "Sikkim," Indian States and Agencies, The Statesman's Year Book 1947, pg 175, Macmillan & Co.
^ "Punjab States,", Indian States and Agencies, The Statesman's Year Book 1947, pg 174, Macmillan & Co.
^ "Assam States,", Indian States and Agencies, The Statesman's Year Book 1947, pg 160, Macmillan & Co.
^ Farhan Hanif Siddiqi (2012). The Politics of Ethnicity in Pakistan: The Baloch, Sindhi and Mohajir Ethnic Movements. Routledge. pp. 71–. ISBN 978-0-415-68614-3. ^ T.V. Paul (February 2014). The Warrior State: Pakistan in the Contemporary World. OUP USA. pp. 133–. ISBN 978-0-19-932223-7. ^ Nicholas Schmidle (2 March 2010). To Live or to Perish Forever: Two Tumultuous Years in Pakistan. Henry Holt and Company. pp. 86–. ISBN 978-1-4299-8590-1. ^ Syed Farooq Hasnat (26 May 2011). Global Security Watch—Pakistan. ABC-CLIO. pp. 94–. ISBN 978-0-313-34698-9. Copland, Ian (2002), Princes of India in the Endgame of Empire, 1917–1947, (Cambridge Studies in Indian History & Society). Cambridge and London: Cambridge University Press. Pp. 316, ISBN 978-0-521-89436-4 .